Adam Friden, Owner of CateredFit, is not the type of person to take no for an answer. He’s also not the type to shy away from a challenge, especially when skeptics call him crazy and say things like, “you’ll never pull it off.” Fortunately for us and his customers, that enjoy over 35,000 meals per week, his company is alive and well after eight years and continues to expand at an incredible rate. 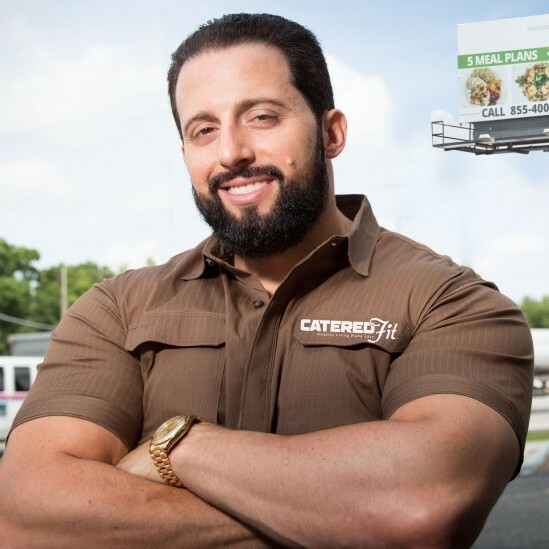 The idea to start CateredFit came in Aug 2010 when a close friend brought Friden an article in the Miami Herald about the first company in the country to offer such a service. “At that time they had already done over $80 Million in sales and had kitchens in 6 states and Canada,” Friden said. The article ignited a fire and Friden wanted a piece of this growing industry. He came up with the concept of a “pilot program” to help validate his idea. He provided three meals a day to 12 people for an entire week. His only request was that they provide honest feedback at the end of the program about whether or not they would pay for such a service. Everyone agreed that they would and CateredFit was born. CateredFit now employs almost 200 people with production kitchens in Florida and California churning out over 35,000 meals per week and grossing well over a million dollars in sales each month. Remember that original company that inspired Friden to launch CateredFit? Well everything comes full circle. In July 2016 they acquired that company and used its assets to open their California kitchen. The expansion is paying dividends. After about a year in the Los Angeles market, CateredFit is already delivering well over 12,000 meals per week and is creating an average of five new jobs per month. We spent a few minutes talking about strategy, growth options, competition and what CateredFit will look like in ten years. Their core marketing strategy is largely centered on guerrilla marketing, social media and Google. “Guerrilla marketing was key to our California expansion because our other means of marketing (google, social media etc) all take many months to begin to bare fruit,” he said. A sometimes popular option to grow and expand your business is through franchising, which basically leverages other people’s money to help you push into new territories, drive brand awareness and ultimately increase profits. “We’ve considered franchising but wisely decided against. We want to control all food production to ensure product across the country is nearly identical in taste and appearance.” They don’t believe franchising is worth the risk of even one negative experience, as a result of inconsistencies, affecting the reputation of the entire brand. The meal prep and delivery market is not the same as it was ten or even five years ago. It seems like every week you hear about a new player trying to get a piece of the pie. Competition is fierce and the things that set one company apart from another are becoming easier to mimic. So how do you avoid competing solely on price when your differentiators become commonplace? Friden explained, “The article I was shown in 2010 about the first company in America to offer daily meal delivery was written in great detail. Their CEO provided an abundance of specifics related to marketing, customer acquisition, logistics etc. CateredFit was born three weeks after I read that article so I don’t want to say too much about what is next, but what I will say is that I LOVE competition. Competition keeps me on my toes. The fact that new companies are now, and will continue to, enter the space keeps just the right level of paranoia churning in my brain so that I do not become too comfortable or complacent. As long as my passion and paranoia remain as strong as they are today, I am sure that we will continue to outwork and outperform anyone who dares to go toe to toe with us.” With that mindset, we have no doubt that Friden and CateredFit will reach their goal of becoming a billion dollar business in ten years with kitchens strategically placed around the country allowing them to deliver fresh meals to every doorstep in America. What’s Friden's advice for aspiring entrepreneurs? “Try not to mix family and friends with business. Success changes a lot of things, relationships in particular. Don't quit your day job until your side hustle can pay the bills. Once you make that happen, then focus your full attention on growing organically and efficiently.” Friden also recommends some great business books including, Delivering Happiness, Tools of the Titans and How to Win Friends and Influence People.